During the 1851 Great Exhibition in London, two women’s lives become irrevocably intertwined when they both fall victim to a nefarious underground fraternity of ex-soldiers from England’s upper crust who have sworn their lives to defending the British Empire—as well as their own decadent lifestyles. In this first volume, young rebel Jennifer Winterfield and the mysterious Kitamakura from Japan forge an unlikely alliance along with Jennifer’s doctor uncle and a street urchin named Pickles. Together they lay the groundwork for a criminal organization that will go on to sow terror in the hearts of the colonialists and industrialists who tried to put them down. The story opens in modern times, with Sir Lionel Barrington celebrating his most recent victory. As the CEO of the arms manufacturing corporation known as S.V.P.P.B., the abbreviation for the Latin phrase “si vis pacem para bellum” (“If you want peace, prepare for war”), Sir Lionel had been faced with a lawsuit holding his company responsible for a deadly incident in which a landmine killed a seven year old child. 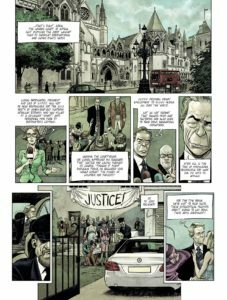 When the London Court of Appeals dismisses the suit, Barrington carries on in his strongly held belief that men like him are above such petty concerns… until those concerns are brought to his front lawn, and his family is called to pay for the latest in a very long line of sins. A leap backward brings us to a chase as three young women run for their lives through the streets of mid 1800’s London. Jennifer Winterfield is the rebellious daughter from a noble family; Kitamakura is a Japanese woman grieving the death of her child, and nursing the rage of a mother not even allowed to mourn the loss; Pickles is the street urchin caught up in events much larger than herself and relying on resourcefulness and cunning to stay alive. The bonds these unlikely three form will be the foundation of an organization whose actions will serve notice to those who believe themselves untouchable, that their sins are not forgotten. 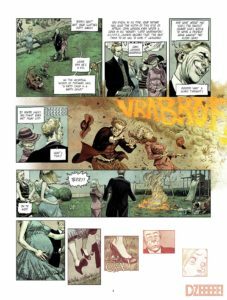 As has very often been the case, Europe Comics raises the bar on the concept of what a comic book story should or could be. 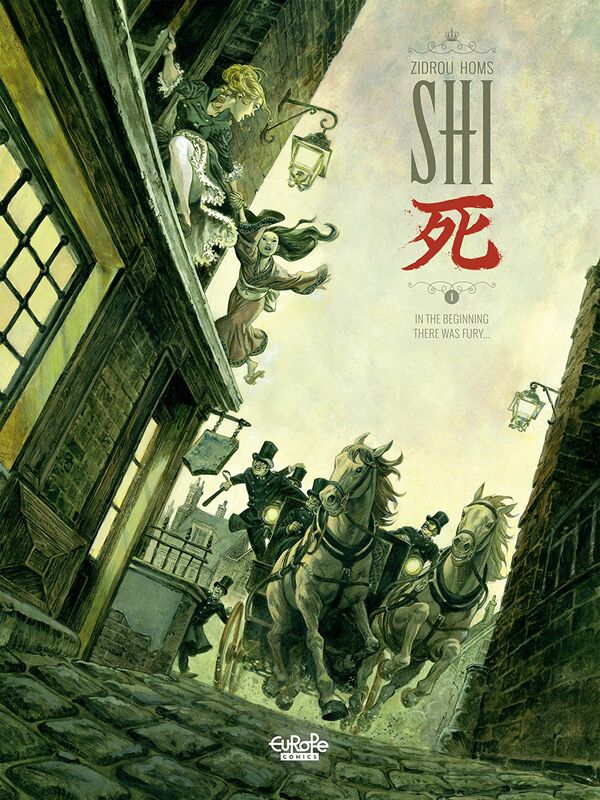 In an unflinching look at England’s Victorian Era, generally thought to be a time of prosperity while still holding to many oppressive and patriarchal ideals, Shi is a dark story of fury and retribution. 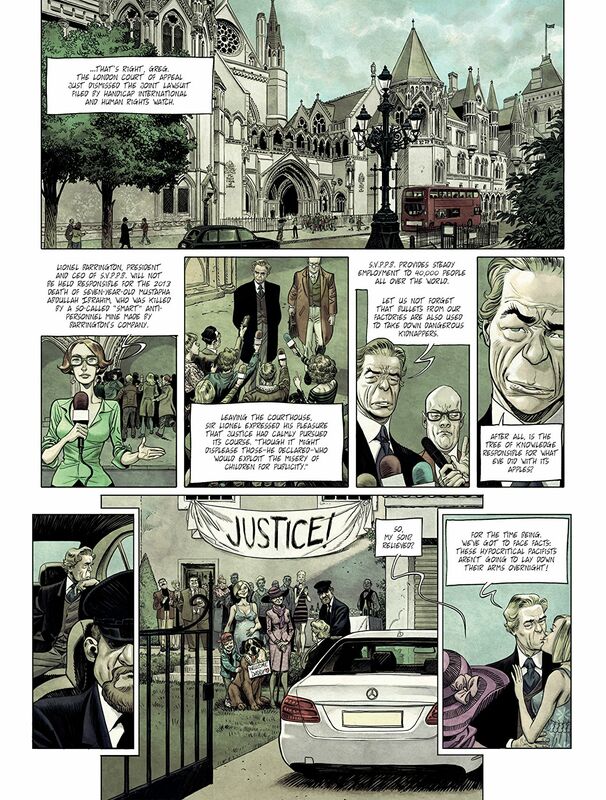 An absolutely “for mature audiences only” comic, holding images that will leave more than a few readers horrified, it’s a beautifully crafted book that reflects some truths some might wish could be ignored. Belgian teacher turned writer Zidrou seems to have gone out of his way to present a cast of characters representing the best and worst of humanity. Where Jennifer Winterfield is the courageous young idealist refusing to conform to the unjust mores of society, the oh-so-creepy Reverend Green is pretty much every slimy self-righteous degenerate you’d cross a busy street to stay away from. The most tragic of Zidrou’s characters, the supremely and oft wronged Kitamakura- “Kita” for short- is burdened with carrying the weight of her many losses and abuses, facing it all with quiet dignity and determination. Zidrou lays out a pretty brutal story, but does it all in a way that it doesn’t come across as intended for mere shock value. There’s a most definite purpose to it all, and it has nothing to do with cheap thrills. Zidrou’s story is illustrated by the gorgeous work of Spanish artist Josep Homs. He brings all of the characters to life, imbuing them with features that reflect the character within, for better or for worse depending on his subject at any given time (refer to the above mentioned Reverend… we’re pretty sure he’s a total creeper from the first time he shows up in a panel). 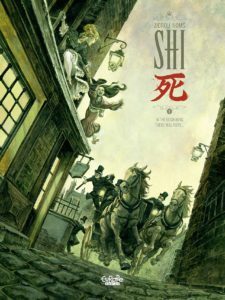 Aside from the many outstanding characters inhabiting the pages of Shi, the backgrounds and settings are simply put, outstanding. 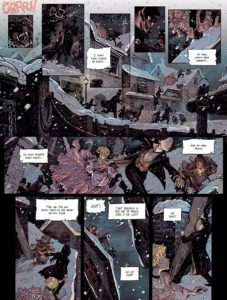 Covering every aspect of Victorian London, from the shiny “crystal palace” of the Great Exhibition, to the urine filled gutters of the lowliest slum, Homs sets the tone for every scene through use of color palette and detail. The real artistry of his pictures is highlighted in panels featuring horrific acts… without shying away from the sometimes disturbing actions on the page, Homs manages to spare the reader unnecessary details by leaving the more disconcerting acts to the imagination using shadows on a wall or cutting away the instant before a blow falls. He uses anticipation and the barest of hints to his advantage, and the effect is a stunning book portraying terrible things. I know that I might be playing up the atrocities depicted in Shi, but as with the work itself, it’s with a purpose. First and foremost, let it stand as a warning to the more sensitive readers out there. The subtitle for this first volume is “In the beginning there was fury…”. That fury is earned in every way imaginable, and given the opening scene and the events it shows, it would very well have to be in order to hang onto an audience. We have to see where the rage comes from in order to stay on board with the retribution to come. Without that emotional involvement, this would just be another book steeped in offensive content for its own sake. If you aren’t bothered by the events surrounding Jennifer and Kita’s introduction and subsequent relationship, seek counseling. But by all means, give this title a try because I get the impression that we’re building up to something truly impressive.